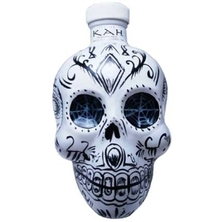 "It was only a matter of time before someone put tequila in a skull", said no one ever. 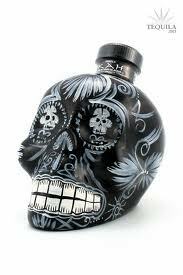 Paying homage to the Dia de los Muertos and the sugar skulls, each bottle is an individually numbered work of art, and they come in two sizes: 700 mls and "Where's the rest." This combination of artistic flamboyance and artisinal distillation is typical of Mexican culture, and we loved them even before tasting them. 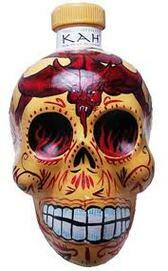 The tequila lives up to the packaging, too, so we snagged some of the mini skulls for Flying Fajita Sistas' guests so they can take home (can't resist the pun) "the spirit of Mexico". Ouch. The nose is filled with cooked agave, sweet earthiness, grass, brine while having a little saltiness. Agave all the way through, with citrus. Nice lingering finish with agave, mint and pepper and a touch more of citrus. Obviously the bottle is amazing. Ultra smooth, ultra strong flavours - ultra burn at the back of the throat. Caramel - of course - pepper, capsicum, vanilla from the oak - more like a calvados than whiskey but with a bigger body. Prominent agave taste with a pleasant, balancing sweetness. Will's own tasting notes again - we don't just cut and paste here! Light gold in colour, with caramel and pepper on the nose and palate - quite supple and sweet with hints of sour-mash whiskey, bananas (a whole bunch of 'em) and - wait for it - umami. I've waited years to use that Japanese loan-word and at last I can. There are some distinct umami flavours and a little agave. Excellent. I may go for a little lie down now. Maybe one more shot for the road.